Support your school on the Artsmark journey with local links into East London’s incredible creative opportunities. Over the past year Creative Schools has brought 160+ arts and education organisations together to explore school improvement through East London’s arts and cultural offer. 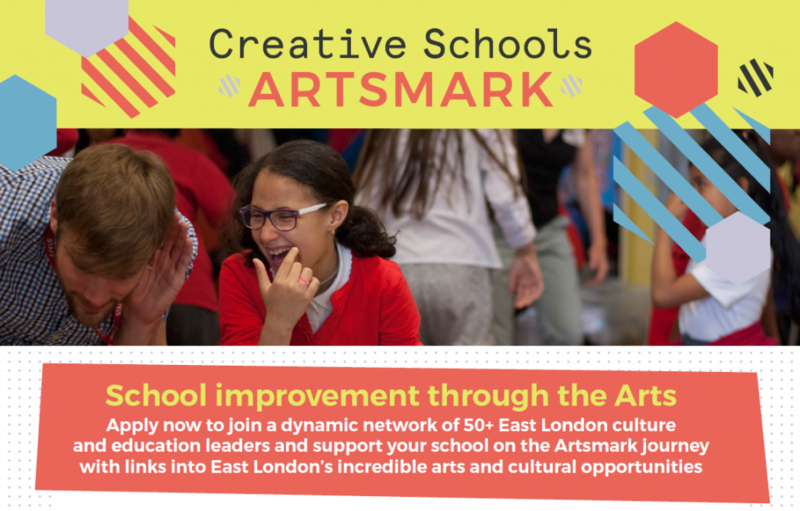 This year we are launching an exclusive opportunity for East London schools to get involved in an integrated Creative Schools Artsmark – an exciting programme that brings together local advice and support for your school improvement needs on the journey to gaining an Artsmark. Download the Creative Schools Artsmark flyer. Artsmark is Arts Council England’s award programme for schools that helps your school to plan, deliver and evaluate a high quality cultural education that supports wider school improvement. Schools taking part in Creative Schools Artsmark will join a dynamic network of 50+ East London arts and education leaders and receive tailored support from arts education experts to support your Artsmark ambitions. This exciting opportunity is open to East London schools taking their first steps towards gaining an Artsmark Award, as well as to schools already registered for the Artsmark that are keen to support their journey by developing partnerships with East London arts organisations. APPLY for your school to be part of the 2017 Creative Schools Artsmark programme. DISCOVER some of the projects being delivered to align with schools and highlights of the 2016/17 programme on our blog.